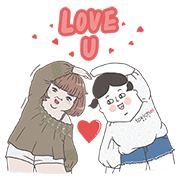 http://www.line-stickers.com/ – tokichoi×Mei Mei & Fei Fei’s Girls Talk Line Sticker | First ever Mr. H.H × Lu collaboration?! And look! Goddess Mei Mei and the hilarious Fei Fei are decked out in TokiChoi, too. Let’s see how their friendship matches up with their outfits. Friend tokichoi’s official account to get the set for free. Available till April 26, 2017.